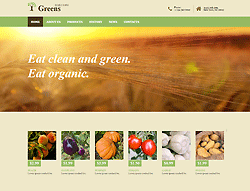 This agriculture Bootstrap theme with a vibrant contemporary layout will nicely bring your business online. Whether it deals with agriculture, food-industry or any other business, you can easily modify this design to look exactly as you need. It is a feature-rich option packed with tools for communicating with customers contact form, effective content presentation full-width slider and sortable gallery, and many others. Being responsive, it is fully-adaptable, so the visitors can view it on various handheld devices. Well-written documentation will help you seamlessly set up the desired site with engaging design and rich functionality.